The Clean Air Act amendments of 1990 originally identified 189 Hazardous Air Pollutants, or HAPs, for regulation. HAPs are pollutants "known to cause or may reasonably be anticipated to cause adverse effects to human health or adverse environmental effects" [Section 112 (b)]. There are currently 187 federal HAPs following the delisting of caprolactam in 1996 and methyl ethyl ketone in 2005. HAPs may be emitted from stationary sources (industrial processes) or mobile sources (cars, trucks and other vehicles). They are regulated by specified controls known as Maximum Achievable Control Technology standards (MACTs) and Generally Achievable Control Technology standards (GACTs). These standards apply to industrial and area source categories, such as paper mills and fuel combustion sources. North Carolina has a health-based toxic air pollutant control program that regulates 97 Toxic Air Pollutants or TAPs. The North Carolina Air Toxics program focuses on chemicals emitted by stationary sources. Modeled ambient levels of TAPs at the source property boundary must not exceed established health-based acceptable ambient levels (AALs). Candidate AALs are recommended by the Secretary's Science Advisory Board on Toxic Air Pollutants (SAB) to the North Carolina Division of Air Quality (DAQ). Following review and analysis, the DAQ submits the candidate AALs to the North Carolina Environmental Commission (EMC) for consideration. North Carolina can also require additional facility emission limits beyond those specified by applicable federal MACTs to ensure that AALs are not exceeded at the source property boundary. 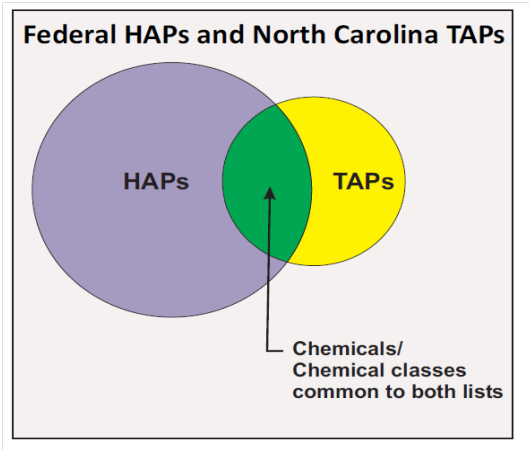 Twenty-one (21) of the 97 North Carolina TAPs are not classified as HAPs while 76 pollutants are common to both lists. Click cursor over circle/circle overlap to view chemical lists.